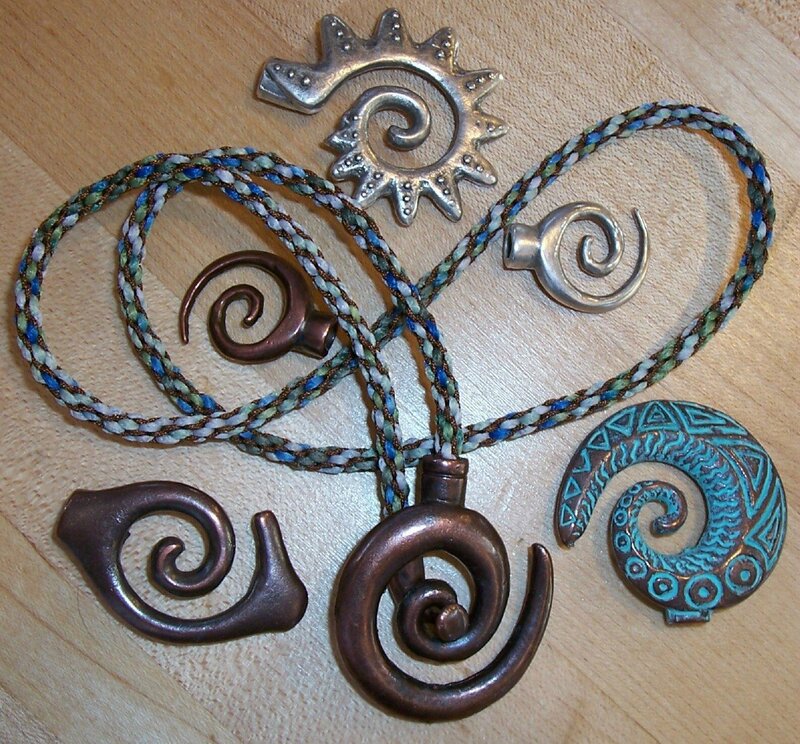 Here are a few ideas for easy kumihimo necklaces. These are samples only; not for sale. This braid was made with Asian Knotting cord for all 8 warps. 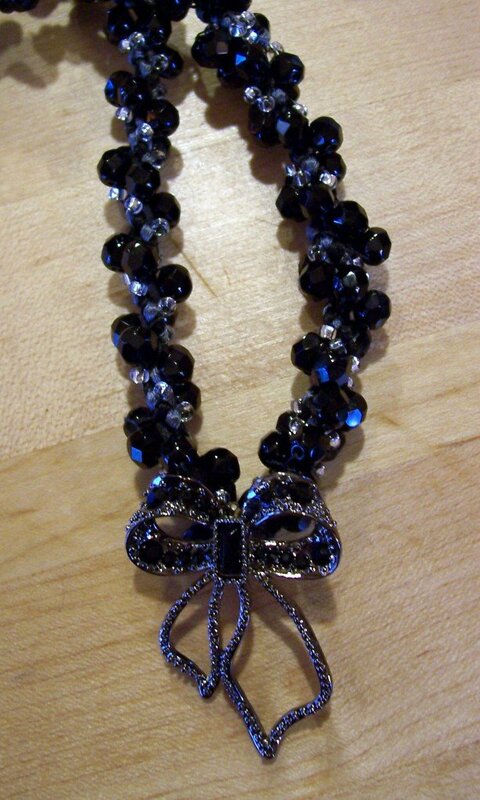 This made it small enough to slip Troll/Pandora/Camila style beads onto the braid. 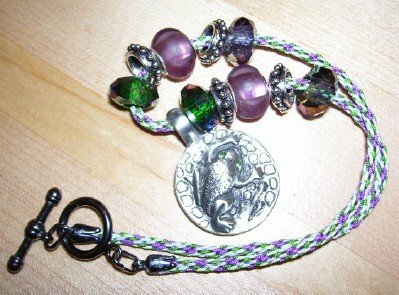 The pendant is Pewter with a bail large enough to be slipped onto the braid. 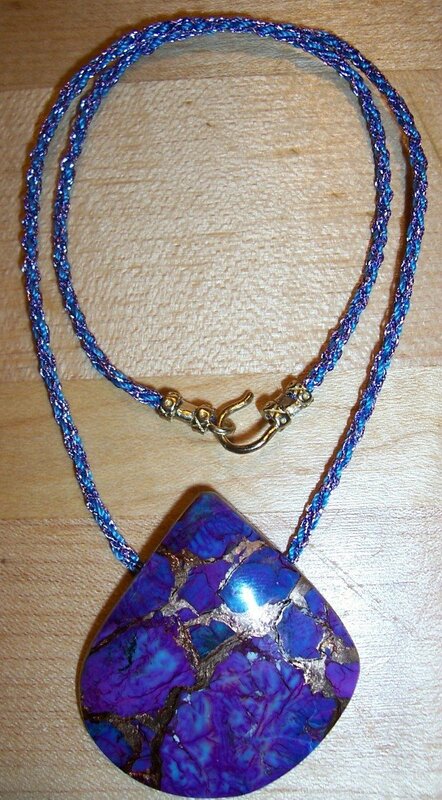 This necklace is slightly more difficult to make than the one pictured above. 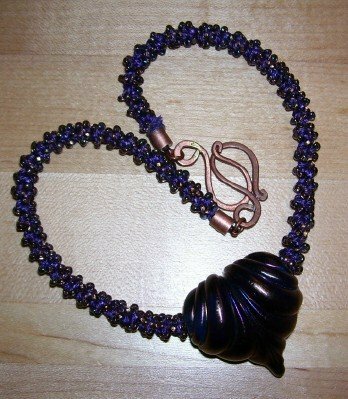 It's made from a combination of rattail, metallic cord, and S-lon with size 8 beads. The focal heart is blown glass with a hole that is about 3mm. I made the first half of the braid, removed the warps from the board and fed the unbraided warps through the heart. Then I put the warps back on the board and made the second half of the braid. The braid below was made from knitting yarn and #18 (Tex 210) S-lon. I made it specifically to showcase these spiral toggles. These toggles are meant to be the focal piece (eg: they are too big to rest behind the neck). The braid in the necklace below features 3 sizes of metal seed beads in 3 different finishes and a lovely German made box clasp featuring Swarovski pearl & crystals. A kit for this item will be coming soon! The clasp is now available in the store under the "Clasps" category. 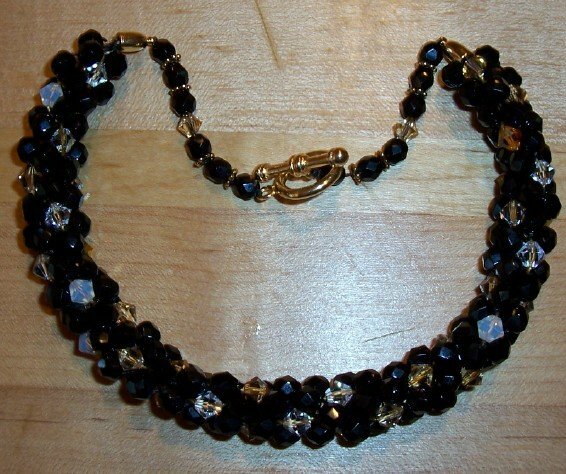 Here's a sweet one that I made by "re-purposing" a focal component from an old piece of my mother's jewelry. The beads are 6mm Jet FP one one warp and size 8/o silver lined crystal seeds from Preciosa on one; the other 6 warps are just #1 rattail in black and gray. This is one I made for JTV. It features 6mm Fire Polish (jet) and 6mm Swarovski bi-cones. Because this braid is quite heavy I made the portion that rests behind the neck a simple string of beads. You can use beading wire and crimps if you'd like for t his portion. I string on S-lon and just knot in between the beads. 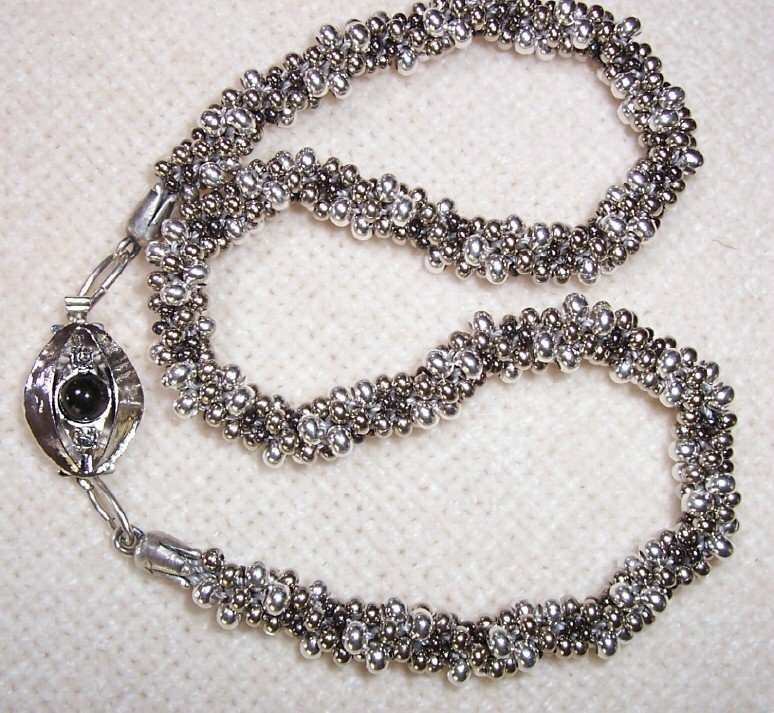 I frequently do to the same thing with a piece of aluminum chain instead of the string of beads. This enables the chunky look without all the weight. This little braid looks simple but it will actually take quite a bit of time to make. The smaller the cord the more time you'll need to invest. These cords were used in one of the jtv kits (click on the "jtv projects" button and scroll down to this photo to get the instructions) and I was fortunate enough to find this cab of Mojave Purple Turquoise from Greg Graupp at bead show.